Every great once in a while, a piece of Pony merchandise will catch my attention and it finds its way into my collection. Over the past few years I’ve grown much more discerning when it comes to purchasing licensed merchandise. It boils down to an issue of quantity and quality for me. 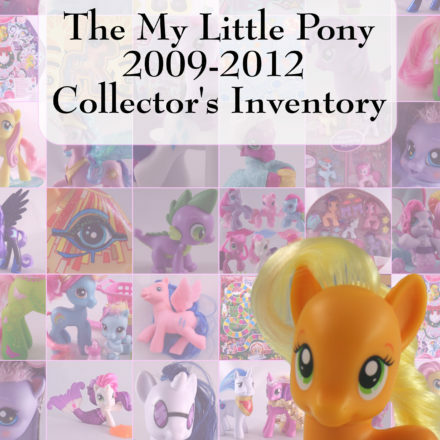 First, I simply don’t have the space to gather up every Pony licensed product. I have a strict, “Ponies belong in the Pony Room” rule, and they are not allowed to spill out into other areas. 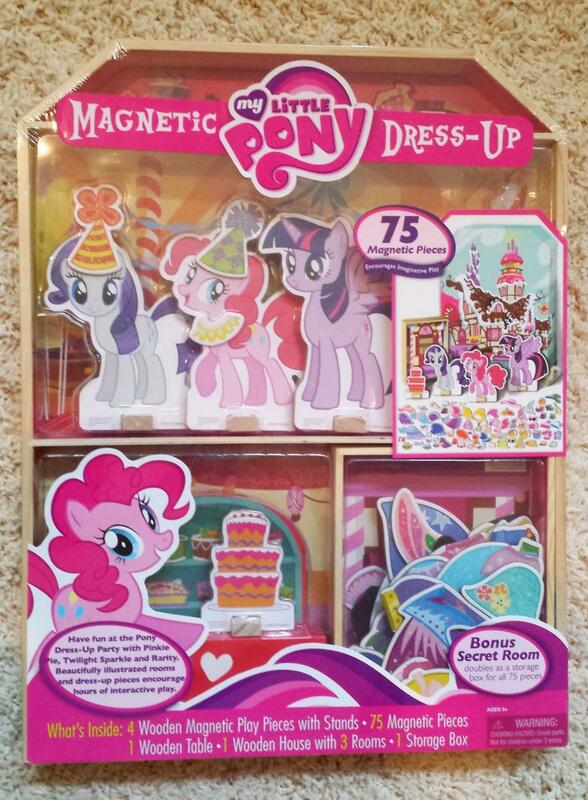 Plus, given that Hasbro grants so many licenses to companies to use the MLP imaging on products ranging from toothbrushes to art supplies, to bedding, it would be overwhelming to keep up with it all. Second, the quality of the products range from okay to really great and I’ve learned to pick and choose over the years. Just because it has a Pony on it, doesn’t mean that I feel the desire to own it. Despite my hesitation to add new merchandise pieces to my collection, sometimes I come across something that I just can’t leave behind. Yesterday, while I was shopping at Sam’s Club I came across this Magnetic Dress-Up & Playhouse Castle and it immediately ended up in my cart. It is adorable! It takes the nostalgic appeal of paper dolls and modernizes it with magnets. 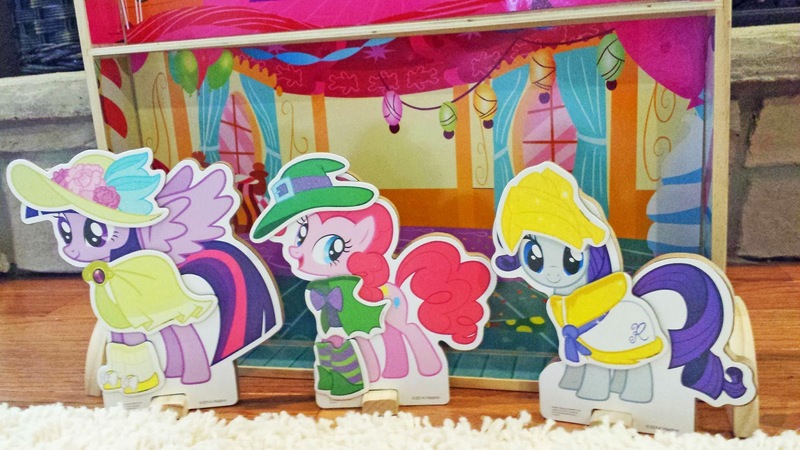 All of the pieces are wooden to avoid wear and tear, and the large 6-7inch tall figures (Rarity, Pinkie Pie, and Twilight Sparkle) come with attached wooden stands so they remain upright during play. 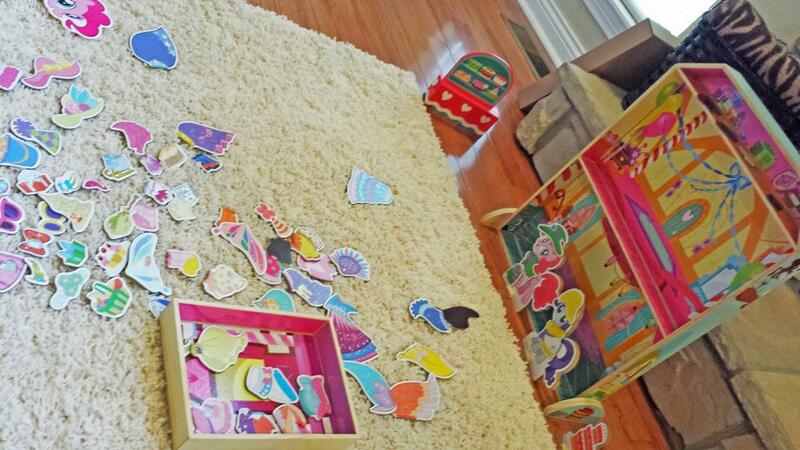 In addition to fun outfits, shoes, accessories (75 pieces total) and a wooden storage tray that doubles as another play area, the set comes with a wooden house that has attachable tip-resistant supports and adorable decals of Sugar Cube Corner. I honestly can’t say enough good things about this product. Plus, the price was, in my opinion, a terrific value. The set retails for $19.99 and is licensed by Artistic Studios, Ltd.
My three year old son and I had a great time mixing and matching outfits on the ponies while he created a storyline involving the Ponies going Trick-or-Treating (inspired by the adorable jack-o-lantern candy bucket accessory.) I will definitely be picking up a few more of these sets to give as holiday gifts to the little girls on my gift list. I’m so happy to see such a great quality product for Pony fans!